You’d think that because it’s summer we’d all be BBQ’ing every day. You might think that, but you’d be wrong. The kitchen and the sink still get a hefty workout in the summer; vegetable scraping, watermelon cutting, ice cube tray filling – the list goes one. There are so many choices for sinks now that you should never feel stuck with a sub-par stainless steel sink from your local big box store. We don’t mean to be rude but even stainless steel sinks can be elegant. We’re not kidding!!! Here is a breakdown of some of the materials used for kitchen sinks and the pros and cons: Stainless: 16- versus 18-gauge The ‘gold standard’ for sinks, stainless sinks aren’t going away anytime soon. 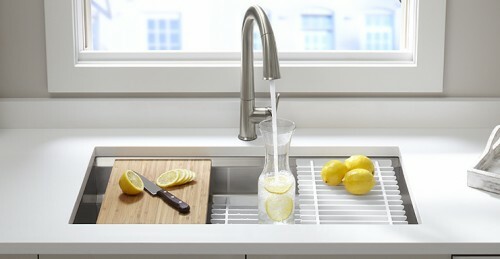 They remain the most popular material for sinks and a well-made stainless really should last a lifetime. You don’t need to worry so much about the gauge – 16 or 18 won’t make much difference. It’s when you get up to 22-gauge that the metal becomes more prone to denting and vibrating, and less able to handle a garbage disposal. Keep this in mind: the lower the gauge, the thicker the steel. If you are worried about sound-proofing, ask your installer to add pads on the exterior’s bottom and sides. 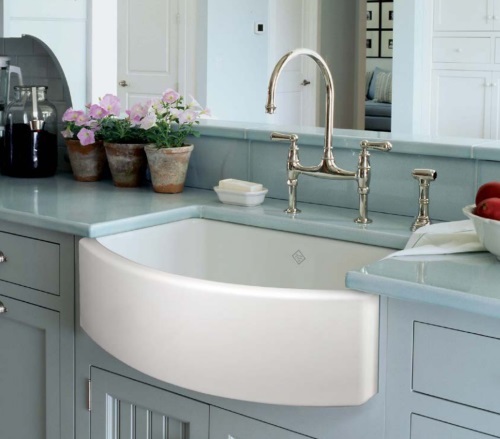 Enamel: Colorful and Easy to Clean These sinks, sold in two versions (enamel-on-cast iron or lighter, less expensive enamel-on-steel), are available in many colors and are easy to clean. The downside to enamel is the chip-factor; drop a heavy pan and you might just chip the sink which in turn can cause the metal underneath to rust. Fireclay a very hard and durable ceramic material that looks almost identical to enameled cast iron. Pros: Non-porous and resistant to acid, alkali, and scratches; relatively chip-resistant; durable, especially compared to other sink materials. Cons: Limited sizes and colors; not "friendly" on dropped dishes; susceptible to stains without proper care; can crack or chip over time; expensive. Solid Surface: Sleek and Seamless If your counters are solid surface, you do have the option of maintaining the ‘line’ by using a solid surface sink, however as far as durability, testing has shown that solid surface sinks might not hold up as well; they are prone to scratching from sharp objects. 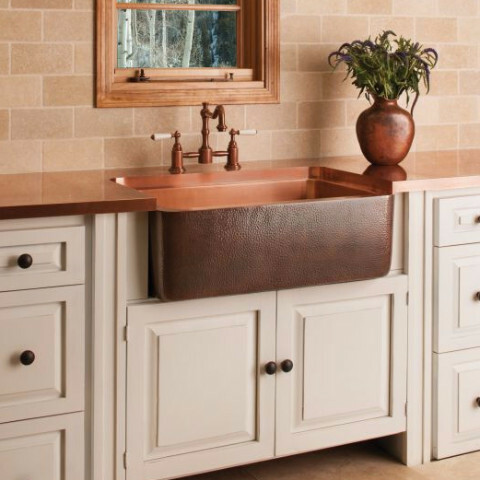 Copper: Copper sinks are always a striking design element, and the beauty of copper is that it’s rust-resistant and antimicrobial, making them a great choice for the kitchen. Just be sure to select a high-quality copper sink that is at least 99 percent pure copper — a small amount of zinc may be added for strength. No harsh chemicals needed for cleaning – just soap and water. Copper is considered a living material, so any striations or discoloring (which would be very slight) just add to the beauty of the sink. And finally -- some other considerations when shopping for sinks: Double or single-bowl Double-bowl sinks let you soak a pot in one bowl while you rinse in the other. Just be sure that at least one of the bowls is wide enough to fit large pots or roasters. 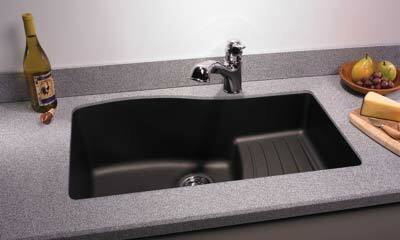 Sinks that are rectangular shaped are standard; D-bowls have a curved back and offer more space, front to back. How deep should a sink be? Bowls are usually 6 to 12 inches deep. The deeper ones reduce splashes, but depending on your height you may find it uncomfortable to reach the bottom of a very deep sink. Remember that undermounted sinks will be up to 1 ½ inches lower than a top-mounted. HAPPY FOURTH EVERYONE - GET OUT THERE AND ENJOY IT!